We are strongly pushing these new "AUX-BOARDS" for many new installations. This option takes so much work out of many installations that you might want to consider this above the Semi-Installation or full installation options. Click on the link to this new page of the Sustainiac website. Read the descriptions and view the installation photos and hookup diagrams. Most of our customers prefer toggle controls, and also push-pull for ON/OFF and toggle for Harmonic mode. The new Aux boards accomplish this with greatly simplified installation process, at a cost option of $10.00. The amount of labor saved and consistency of sustainer performance more than justifies this cost add-on. In fact we are so overwhelmed with back-orders on full installations and Semi-Installations that we would like for our customers to give very strong consideration to this new option. SEMI-INSTALL OPTION FOR MOST GUITAR TYPES: $75.00-85.00 We do 90% of the work. We supply a completely wired and TESTED set of electronics for your guitar, including Sustainiac circuit board and controls, pickup selector, volume and tone controls. 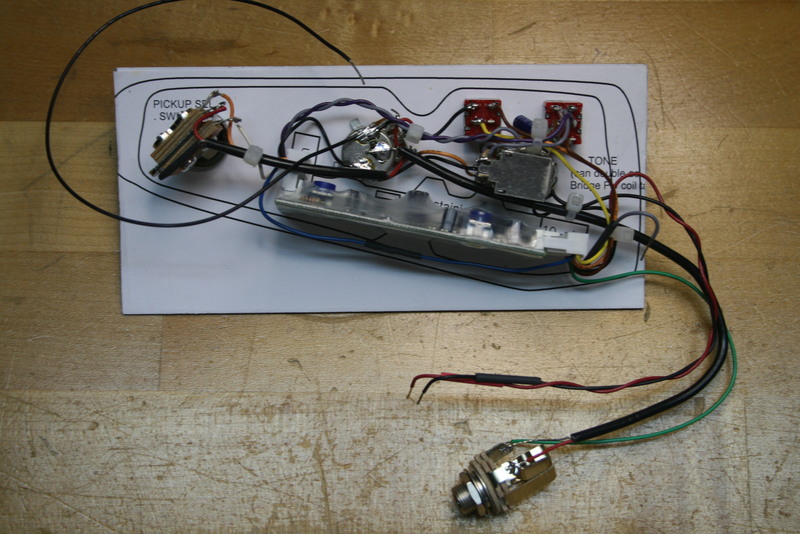 You simply remove all of your existing guitar cavity parts as a "glob", after disconnecting your output jack and pickups. You can then save this "glob" of parts to restore your guitar to its original condition if desired with only a small amount of work. We can also do pickguard installations where the entire pickguard is wired and tested for about $100 as shown in the two following Strat photos. TOGGLE CONTROL OPTION $85.00: Most SYN CUSTOM owners prefer toggles. Toggle controls go in as shown on the two drawings. 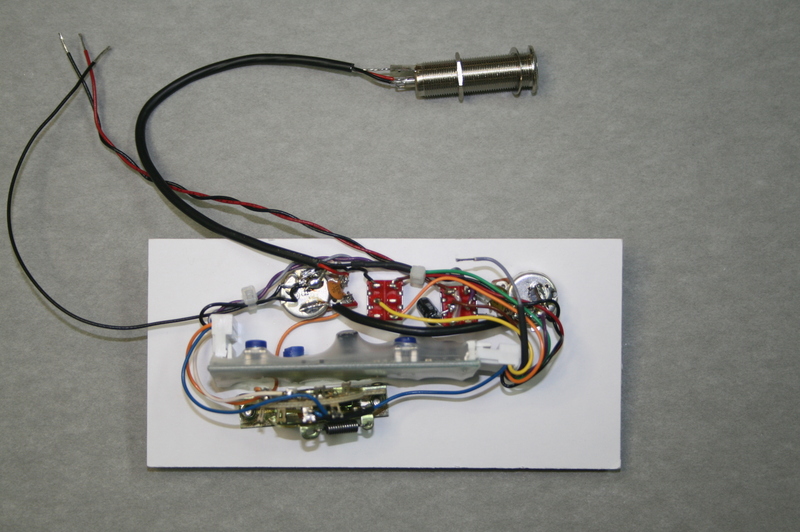 The tone pot can be either rewired to become a Sustainiac drive control, or can remain the tone control. 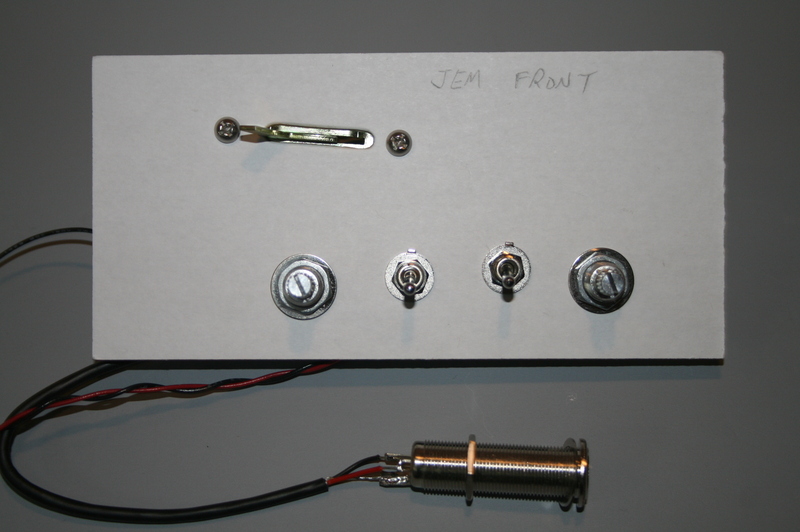 This can double as a push-pull bridge pickup coil tap, or a neck pickup boost/tone selector. PUSH-PULL SYN CUSTOM OPTION $75: Sustainiac controls are push-pull. Volume control doubles as Sustainiac ON/OFF control. Tone control goes away, and is replaced by Sustainiac Harmonic Mode control. Gibson Les Paul Option $80.00: Sustainiac controls are push-pull, and replace the neck pickup volume/tone controls. Neck volume control doubles as Sustainiac ON/OFF switch. Neck tone control goes away, and becomes Sustainiac Harmonic Mode control. Bridge pickup tone control becomes MASTER tone control. (Optionally, you can make neck pickup volume control a MASTER volume, and retain neck and bridge pickup tone controls.) 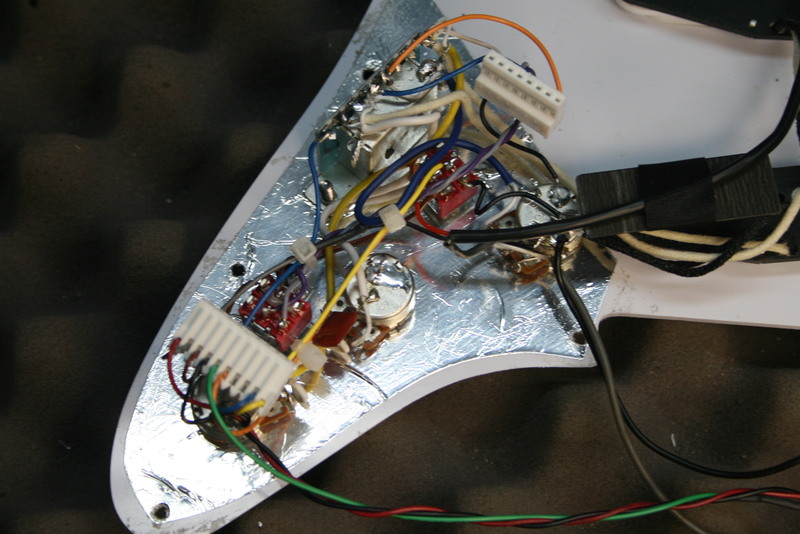 The Sustainiac board BARELY fits in the space between the neck pickup and bridge pickup controls. 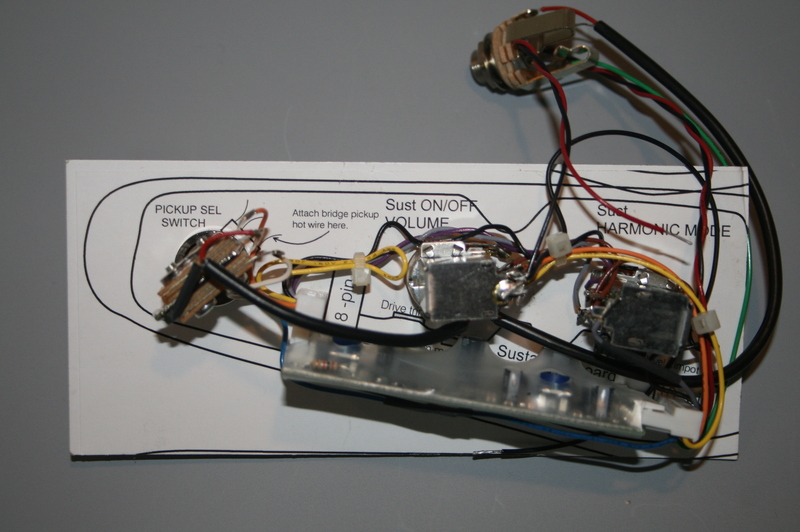 You have to wire up the bridge ground, battery, output jack, and pickup selector switch. You use the existing selector switch wires without removing them from the switch. GENERIC SEMI-INSTALL We can do a custom Semi-Installation for you. We have a catalog of many guitar model cavity drawings. If we don't have yours, you can make a custom drawing and email it to us. 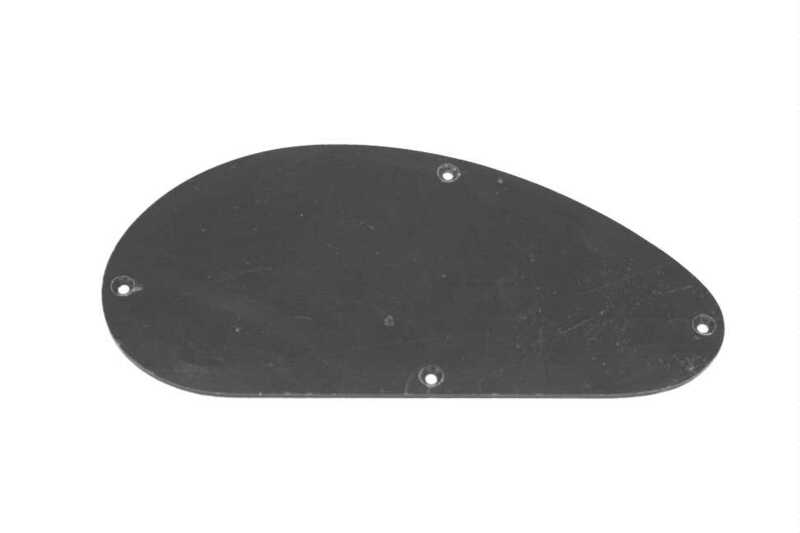 Measure the cavity width, length, and hole spacings, also pickup selector. Show these dimensions accurately on your drawing. 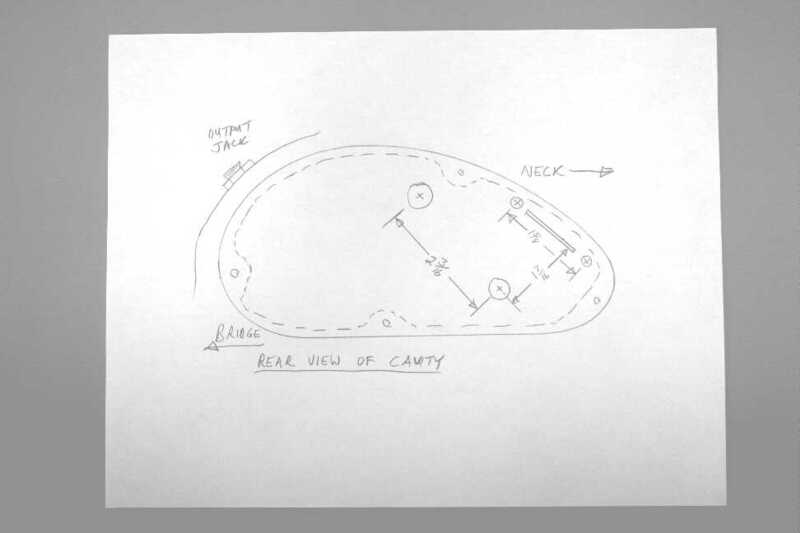 Label the drawing to show that it is the BACK SIDE of the cavity. 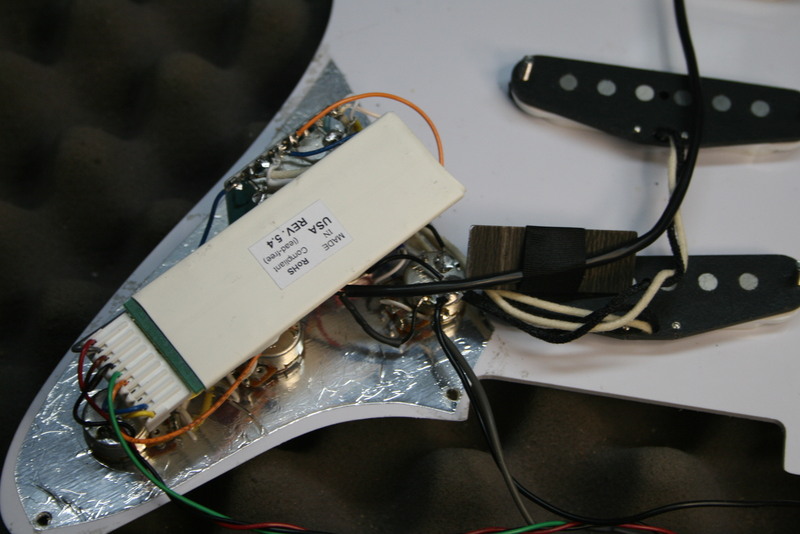 Indicate the direction of the BRIDGE and the NECK so we can orient the pickup selector properly. Show the output jack location. We will pre-wire the output jack for you if you show this. 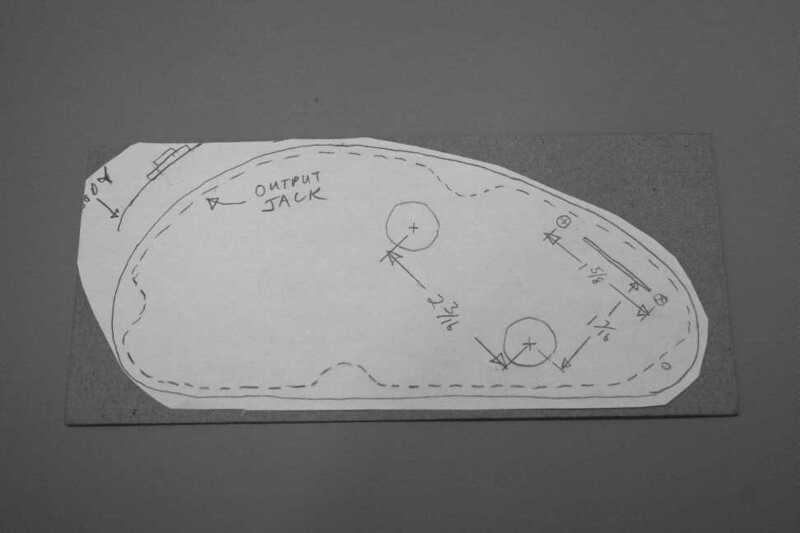 Print the 1:1 scale circuit board drawing from the PDF link: STEALTH PRO CIRCUIT BOARD You will use this drawing to determine if it will fit into your cavity without routing. 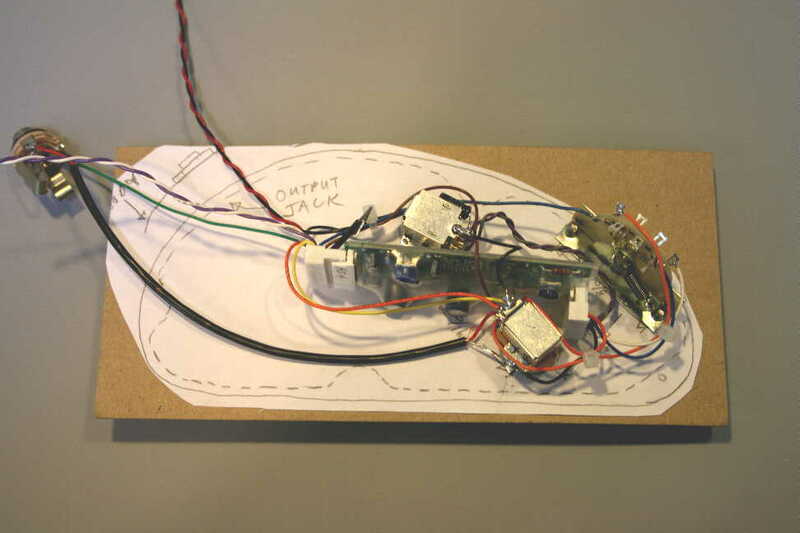 Cut out the printed circuit board outline. Lay it in your cavity to determine where the board will actually be placed. Orient the board so that the 8-pin connector is near the pickup selector switch. This most important step makes critical guitar signal wires as short as possible, which minimizes signal distortion or even oscillation. Then, using this info, we will create a complete SEMI-INSTALL with volume/tone controls, Sustainiac controls, and pickup selector. We will keep a small amount of extra slack in the wiring to allow for small errors in measurement. COMPLETED SEMI-INSTALLATION This picture shows a $75.00 semi-installation.